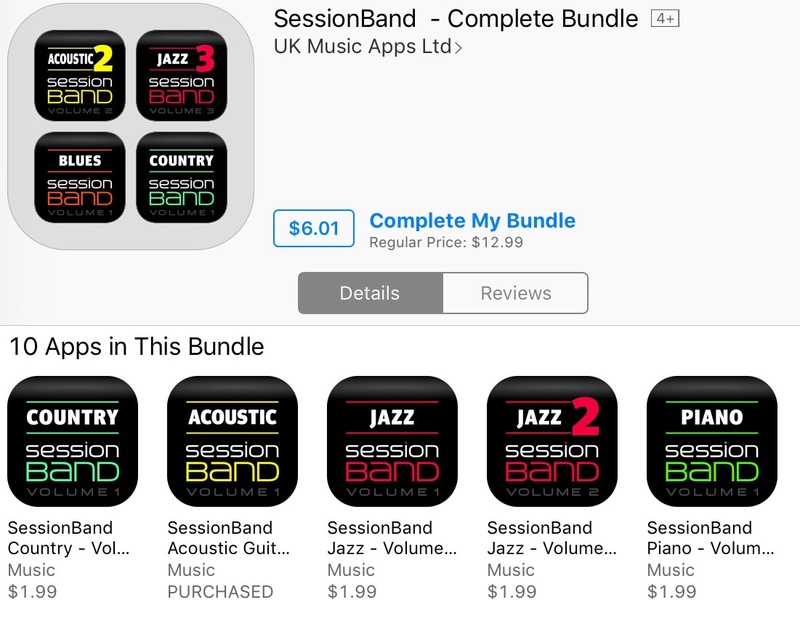 Session Band Apps still On Massive Sale! Don’t forget bundles! If you ever have worked with Band In A Box then you are familiar with the concept of the Session Band apps. These things are pretty crazy fast to get a background for a piece of music you are working on. Pick the Session Band app that best fits the style you are going for, type in some chords and hit play! Boom…. Instant fun! There is at least one HUGE difference here in these apps from some other apps like Band in a Box the loops you find in Session Band are actually recorded by real people! This means even better and more natural sounding loops. The loops all allow you to adjust tempo to your liking. The loops are also copyright free which means you can use the genius results from your explorations in your next big CD release! Here's another thought too…. BUNDLES!!!! I love bundles of apps but really wish they were easier to find! Here's the fun part…. If you have already purchased one or two of the apps then when there is a sale going on the bundle becomes cheaper too! So in my case the bundle of Sessin Band Apps has 10 of their apps included and costs $12.99 currently. I've bought 2 of those apps before so through “Complete My Bundle” my price now is $6.01! Now THAT is a deal! These apps are a great starting point for some people, for other people they actually can serve as excellent accaompaniment tracks for performance. Other people will get inspired by them and others will spend hours in these things.